The last two weeks I have been busy with a course I gave last week (2x two hours lectures, 2x three hours practical) on Protein Structure. I had slides from last year at my disposal, but added some stuff, including a pointer to Google Play's page for the Jmol Android App (cool stuff!). The content involved the basic links between primary, secondary, tertiary, and quarternary structure. At Maastricht University we use problem-based learning, and the topics for the students of this block (two bachelor studies) were aging and immunology. Interesting, because as a chemist I have limited background in these fields. 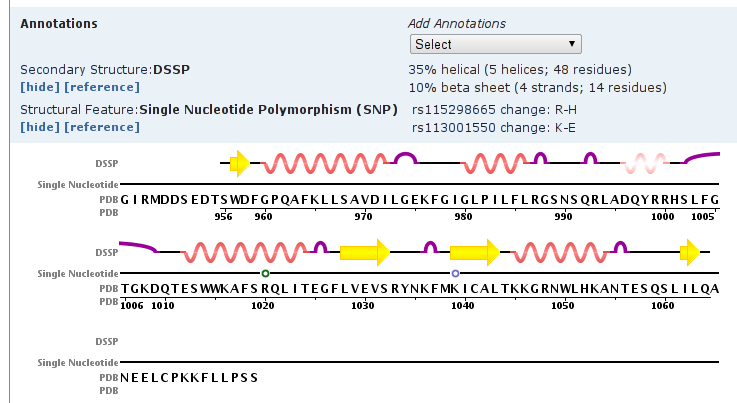 Other content in this bioinformatics course done by our BiGCaT group involved SNPs, and I found a few interesting examples. 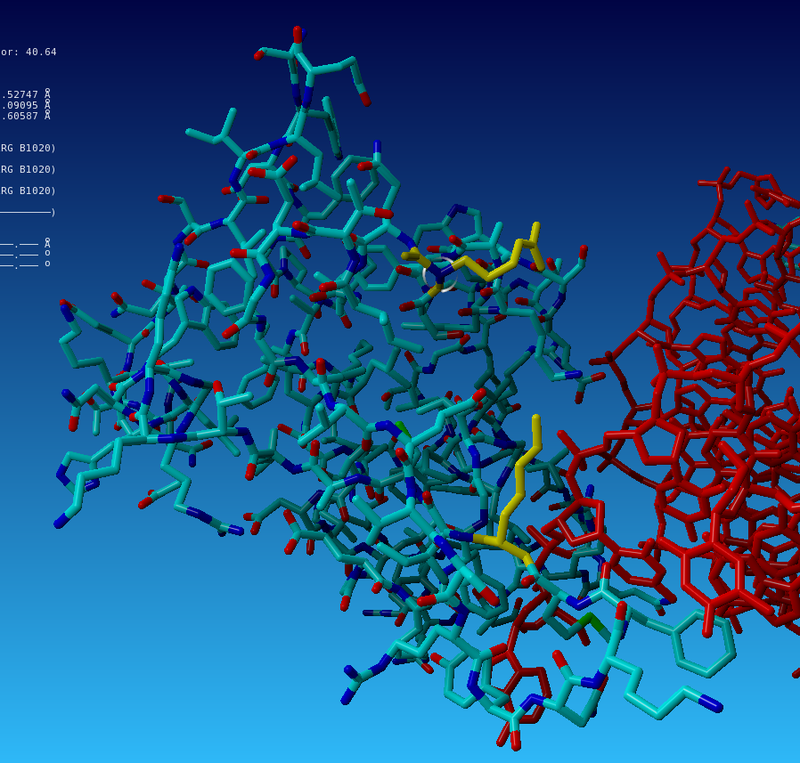 As protein structure visualization tool, the course is using Yasara, a great tool, but next year I will prefer to use Bioclipse. So, next year, one of these exercises will basically become a Bioclipse plugin with a nice cheat sheet. I also plan to finally write that plugin that educates people in the Jmol scripting language. Who wants to team up for that? 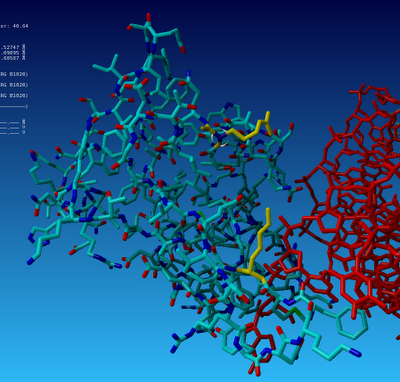 In the middle is a small peptide (element colors), broken down by the normal cell from a Epstein-Barr virus. The membrane-bound protein parts are missing, but if you just imagine two huge cells on the left and right of this! And this simple complex has many variants on the T-cell receptor side, allowing our human body to adapt to all sorts of viruses, etc. This is what life looks like! Isn't chemistry amazing! Mmmm... when I pasted the list of changes in the CDK 1.4.8 release (download it here), I was surprised by the length. Then again, the 1.4.7 release was almost three months ago. 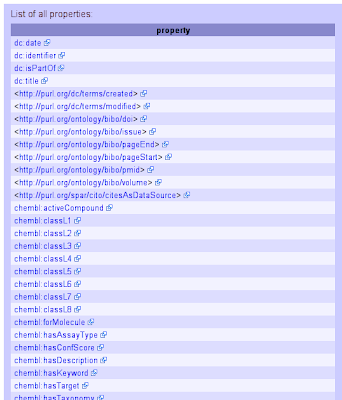 However, a careful look at the list shows that quite a few are JavaDoc fixes, additional unit testing in the inchi module, and other small tuning. Of more much more interest are the fix in the SDF parser, which failed to continue reading when it encountered a broken molfile entry in the SD file. For some just as important, the DeduceBondSystemTool got some attention, and Kevin improved the code by having it look for all rings only in isolated ring systems, a trick we use elsewhere too, speeding it up significantly for some structures. BTW, that class still has limitations, and we are discussing other options. Atom parities can now be read and written in the MDL molfile format, and IUPAC isotope masses have been updated for a 2009 report. The PDB and MDL readers have seen two further improvements. All in all, enough to mark this release too as a highly recommended update in the 1.4 series! 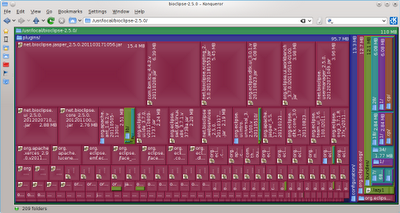 OK, formally, I had 26 patches, but two were gitified by me, but .java files sent by Kevin Lawson. A third patch was based on suggestions from Nils. BTW, I have a tendency to end up in the upper part of this list, but please keep in mind I gain extra commits with minor, maintenance tweaks, and that I am tremendously happy with contributions from all! This release is another one, largely the result of work from less frequent contributors, but summing all those up, it defines what makes the CDK project going! Thanx to all in the CDK community! Likewise, the importance of these reviewers should not be underestimated too. And this list only gives the names of the people that signed of patches; the list of reviewers is sometimes longer! In fact, one of my patches was the direct result of excellent peer reviewing by Arvid Berg (Uppsala University), who suggested me to use a one-line Method.isBridge() call, instead of my 40 lines of code! Well done! Description: Biological pathways provide intuitive frameworks to integrate and co-analyze different kinds of biological data, such as system-wide transcriptomic, proteomic, and metabolomic measurements. While insightful, pathway analysis is generally limited to qualitative conclusions, and the analyses can only be as powerful as the curated annotations can enable. 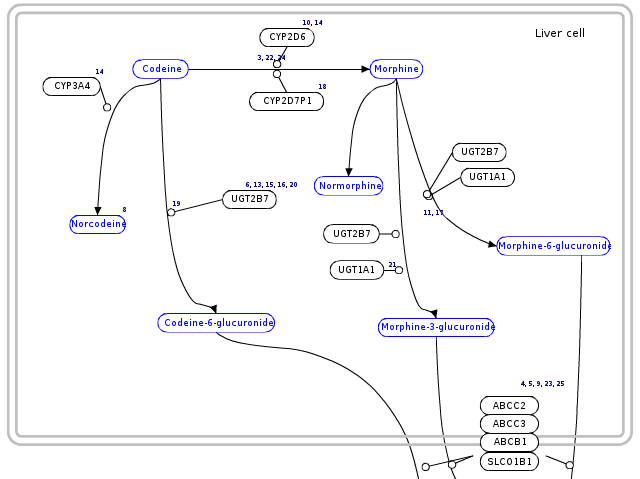 Using our open-source pathway analysis platform, PathVisio, we will bridge pathway analysis to the wealth of quantitative approaches already in development for metabolic network modeling, such as flux balance analysis and dynamic simulation. Our focus will be on the visualization of the modeling results, which will be critical for understanding how simulated models correlate with experimental measurements. The same biological processes that are visualized in pathways are also described by quantitative models. For example, the arrows that connect entities within metabolic pathways actually represent metabolite fluxes. The integration of large scale data analysis with modeled or measured fluxomics data, will help to gain more insights into the mechanism of the biological process. The meeting is in the BiGCaT course room (1.302 In H1), UNS50 south wing 1th floor from 16.00 to 17.00. I have been previously mentor, when Alexander worked on Strigi-Chemistry, desktop searching for chemistry, already 5 years ago! De Volkskrant reported this morning very worrying news. Dutch minister Bleker threatens Dutch researchers to censor them, based on the idea that publishing is exporting knowledge, and therefore needs a permit from his department. One has to realize this is in the context of the flu mutation research in Rotterdam (see H5N1, and this Nature item), but such censorship threat is unacceptable, and is a direct attack on science. "Geheel terloops gaf Bleker aan dat hij een nieuw machtsmiddel denkt te hebben om publicatie tegen te houden. Publicatie staat voor hem gelijk aan export van gevoelige kennis en daarvoor is een vergunning nodig." "Bleker indicates he believes he can use a means of power to stop the publication: publication is to him equal to export of knowledge for which a permit is required." Very much like you need to export military weapons. For him it makes no difference for this reasoning if the publication itself is with a foreign (Nature, Science) or a Dutch (Elsevier, local newspaper) publisher. The virus image is in the public domain and available from Wikipedia. Oops... I forgot to get an export permit! 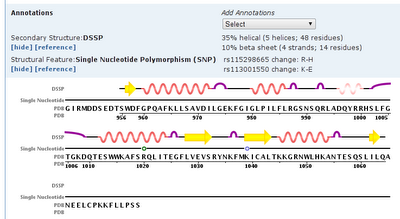 The code is available from the bioclipse.rdf repository. Daniel Swan pointed me to this blog post with a rather interesting title: Exploring multiple cancer genomics alterations with Gitools. 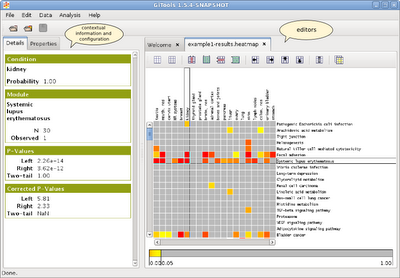 The Gitools is more than a library, but just the visualization seems interesting already. Gitools itself is licensed Apache 2.0 and I am wondering if we can reuse this in other projects, e.g. Bioclipse. Update: this work is now described in this paper. Last week, ChEMBL 13 was released, with even more data, data fixes, etc. Since my RDF for ChEMBL 09 my workflow has become more solid and uses more common ontologies, started using more common ontologies and ontologies I just like, such as CHEMINF and CiTO. Below is an overview of the resource types present in the RDF: activities (almost 7M now), chemical entities, assays, targets, and documents. The new data is not fully backwards compatible. The changes to the RDF include the use of cito:citesAsDataSource, more typing using existing ontologies, e.g. 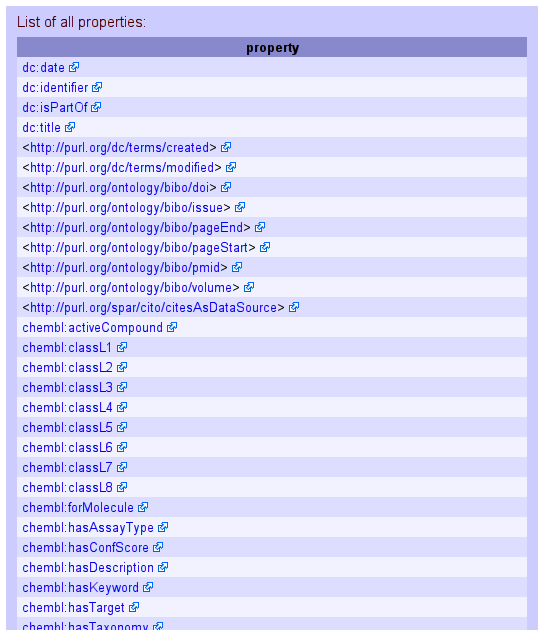 with cheminf:CHEMINF_000000 and pro:PR_000000001 from the PRotein Ontology. A paper dedicated to the ChEMBL-RDF is in preparation. Existing use cases can be found here. define at most five diverse concepts by which triple sets can be summarized for the (life) sciences. 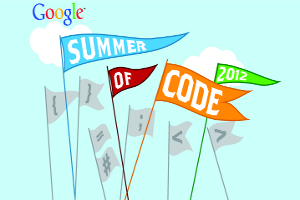 The website schema.org is used by various big web players to define a small set of entities omnipresent on the web. Talis' Kasabi uses this to summarize the triple data sets hosted, and uses the few entities for graphical icons combined with the number of resources of that type. Now, schema.org defines types like Person, Organization, Event, and Product. To summarize the content of (life) sciences data bases, we need different entities to graphically summarize the triple set content. For example, Material Entity could be one, and Organism another. Sample might be useful, or perhaps Experiment. Any set of concepts will do, but the challenge is limited to a mere five concepts. General terminology is therefore more suitable than detailed concepts. Keep in mind that more detailed vocabulary overviews are typically available anyway, but those are detailed to provide a short overview. Indeed, the five concepts must also advertise properly the content of the triple set, so that scientists can quickly see if this triple set is of interest to them. Arvid has done a hell of a job getting Bioclipse building on the Hudson server. I have been configuring the system to compile Bioclipse extensions, and it is not trivial; I dare say, it's harder than learning git. New binaries are now available with further improvements to the core platform, ultimately leading to the next stable Bioclipse 2.6 release. Well, I can say it is worth the wait, but several papers have already been published showing 2.6 functionality, such as the Bioclipse-OpenTox paper. 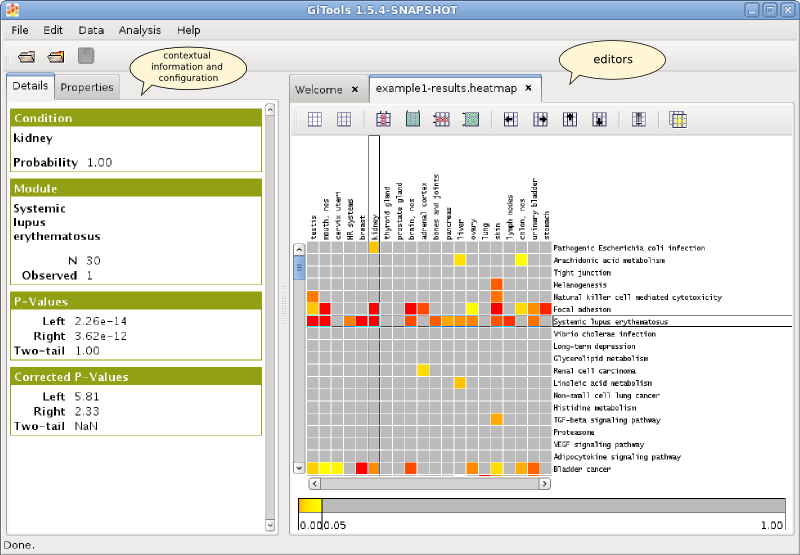 The largest plugin turns out to be the Bioclipse plugin for JasperReports which is used by the Decision Support plugin. I do not have all source code of all Bioclipse extension installed, and cannot see if there is other code also depending on it. 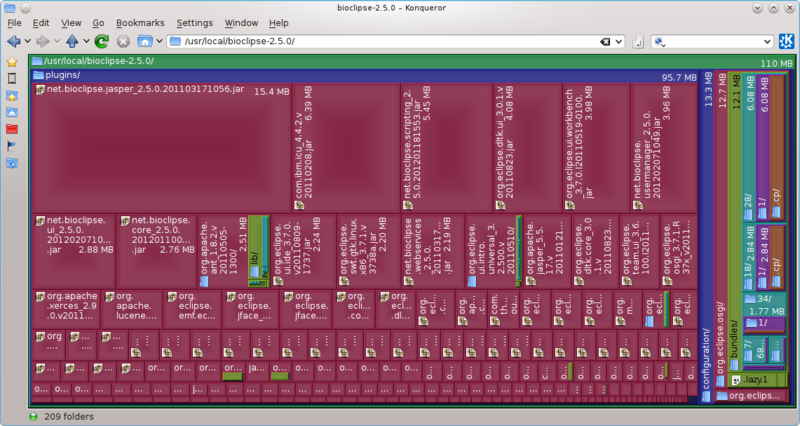 But if that is not the case, it may be a nice opportunity to make the default Bioclipse download a bit smaller.